THE REALITY OF ‘THE ROAD NOT TAKEN’, BEGINS AT THE CROSSROADS WHERE YOU REALIZE THAT THE ALMOST UNTOUCHED AND NARROW PATH CAN LEAD YOU LITERALLY ANYWHERE. THOSE TREACHEROUS PARTS OF QUICKSAND THAT CAN TURN THE SCALES ON ANYONE’S DECISION TO ENTER. 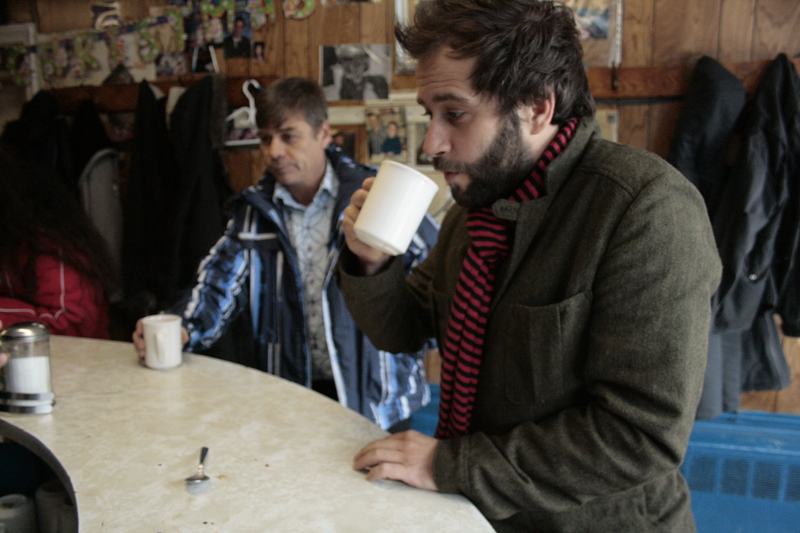 WHEN CANADIAN SINGER/SONGWRITER CHRIS VELAN STOOD AT THE INTERSECTION, AFTER PASSING THE BAR AND WORKING TOWARDS A CAREER AS A HUMAN RIGHTS LAWYER, HIS INNER TURMOIL WAS RESOLVED BY THE INVITATION OF TWO COLLEGE FRIENDS, BANKER WHITE AND ZACH NILES, TO FOLLOW THEM TO SIERRA LEONE, A COUNTRY IN WESTERN-AFRICA PLAGUED BY THE HORRORS OF A CIVIL WAR, TO COLLABORATE AS A MUSIC PRODUCER MAKING THE DOCUMENTARY ‘SIERRA LEONE’S REFUGEE ALL-STARS’. INSPIRED CREATIVELY, AS WELL AS SPIRITUALLY, BY THE EXPERIENCE CHRIS RETURNED TO WRITING MUSIC. HIS EFFORTS RESULTED IN ‘IT’S NOT WHAT YOU THINK’(2003) A SELF-PRODUCED FOLK/POP DEBUT AS A SOLO-ARTIST. 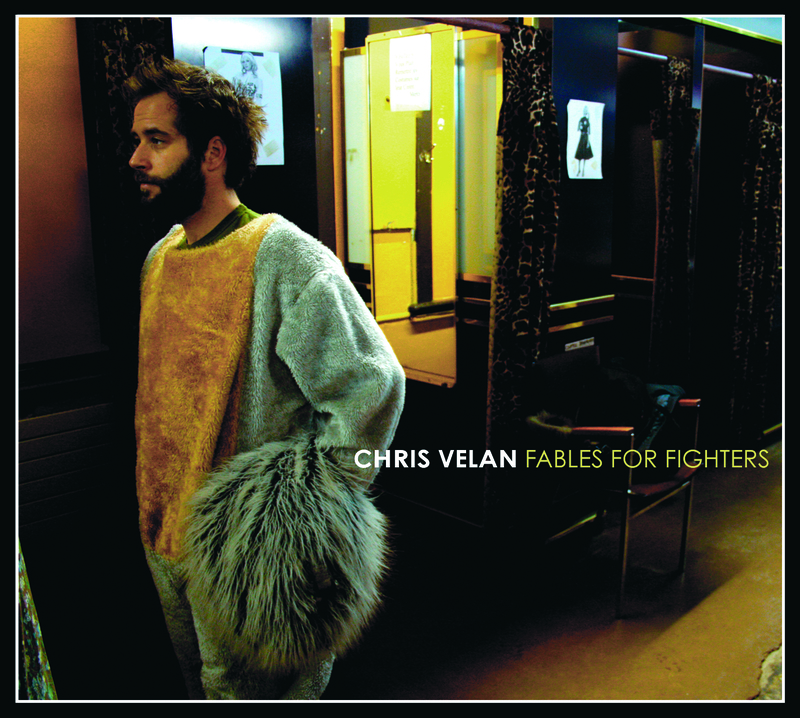 IN 2011 HE RELEASED HIS FOURTH ALBUM ‘FABLES FOR FIGHTERS’, A NAKED, POETIC RESPONSE TO THE EXPLORATIONS OF THE BOUNDARIES OF SOLITUDE WHILE TOURING IN SUPPORT OF HIS THIRD ALBUM ‘SOLIDAGO’. 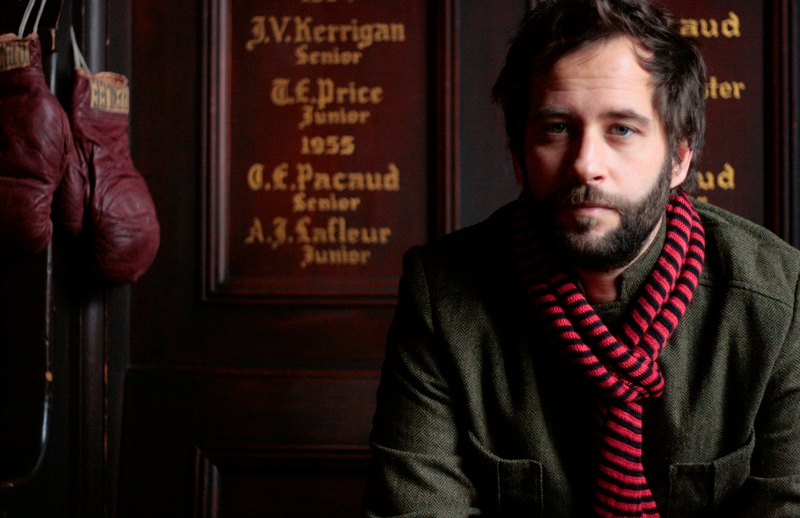 FROM BROOLKYN, NEW YORK: HERE’S CHRIS VELAN. Sanderz: How would you describe the essence of solitude? Chris: That’s a very interesting question. Let me think on that for a second. I look for solitude in nature. I find it hard to find solitude among people, because I’m naturally drawn into the energy from their world. So, my solitude I tend to find in natural settings alone. But, if I have to define it, I suppose it’s just a state of mind in which you can be alone with yourself and explore your relationship with the universe. Sanderz: Do you often seek that kind of solitude? Chris: I do when I feel disconnected and try to get myself to a place and get myself together. I usually come to a natural environment: the mountains, the ocean or a forest. I center myself to bring me back and reconnect me with myself. I have a pretty hectic lifestyle: I’m a musician and tour a lot. I do tend to get a bit fractured. It’s hard to stay grounded in a way, so I find that super ‘hippic’ extremely helpful for me to have as a tool. For that reason I try to set time aside, because it’s very easy to feel disconnected when I have to drive around a lot and perform in different places every night. There is a necessary amount of solitude that you need to cultivate in order to wrestle creatively as an artist and a songwriter. It’s hard. You have to remain open to whatever your muse -or that creative impulse may be. It requires cultivating a certain space around yourself to give you that ability to be open, to listen to those creative impulses and be able to write songs. 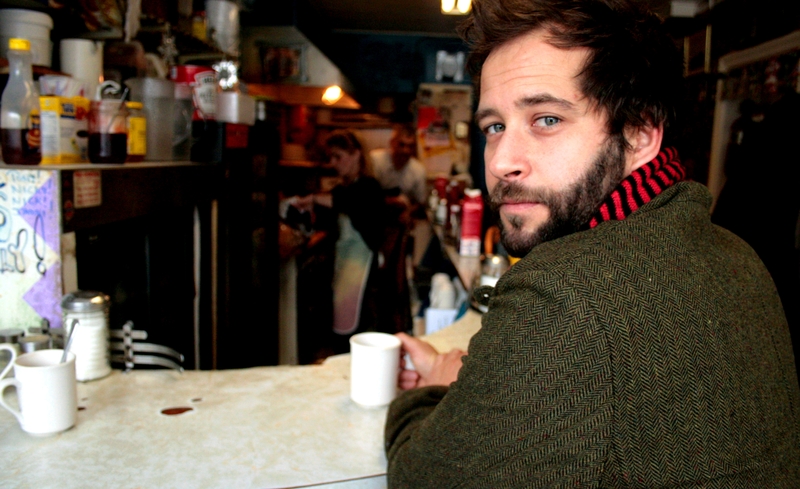 Sanderz: Your latest album “Fables for Fighters” is a very personal record. How would you explain the title? What came through in all of these songs was the, I wouldn’t say struggle, but some sort of fight to overcome something: to rise to challenge or a desire to transform, overcome these things in oneself that holds one back. That scene of transformation and struggle seem to emerge in all of these songs, once I looked back over them. The title just came to me: ‘Fables for Fighters’ with a certain amount of imagery, a fable like imagery, like in the song ‘Any Number of Ways’ the opening song on the album. It was a title that stuck in my head and a way I was describing all of these songs. Sanderz: What has been the reason to use live takes to record the songs on ‘Fables for Fighters’? Chris: On past albums I took a more overdubbing approach. That was necessitated by not having the ability to do a lot of pre-production and rehearsal with the various bands I was working with. On those past albums we used overdubbing as the way of creating as we went along, whereas for ‘Fables for Fighters’ I had the chance to do a lot of rehearsing in advance with the band. Iestyn Polson, the producer I was working with, shared my view that there was a certain disconnect between the energy that one would experience during one of my live-shows and what one was getting from listening to the album. We wanted to capture some of that raw energy and emotion that comes with a live presentation on an album. When we actually went into the studio, we did eleven songs in only three days because we were so ready and could focus on capturing the right take emotionally and energetically. It was very tiring, but I’m glad we did do it that way. I think that’s how I want to do albums from here out. You really have to commit to the take and when someone makes a mistake you have to do it again. But that notion of committing to it is very nice. There is a certain honesty to it: saying ‘this is the best we can do at that moment’ and there is something about that I really like. Sanderz: Iestyn Polson has produced ‘Fables for Fighters’. How do you experience having a producer on board rather than to self-produce? Chris: I’ve tried producing my first two albums, co-producing actually. It was a good experience, but I realized it’s a hard thing to self-produce. I wasn’t quite ready. It was probably premature for me to be doing that. You have to be wearing different hats and have a real awareness of yourself as an artist and not everyone has that right of the back. With this album I really wanted someone to push me to do something different and pull something out of me that I wouldn’t necessarily otherwise pull out of myself. I knew I wanted to be working with a producer and then I was put in touch with Iestyn through my label. We hit it off. I really liked the work he had done with David Gray. It was a good dynamic, in the sense that I trusted his aesthetic and artistic views. He kind of pushed me to step out of my comfort zone, which is very important for an artist, especially when you’re recording. Sanderz: It seems that the change in our climate directly affected the recording for “Fable for Fighters?” (warmest July on record) How did you adapt to such working conditions? Chris: I don’t deal well with really hot weather (laughs). I’m more like a cold weather person. So when it’s extremely hot and humid it starts to really grind me down. As I mentioned we were rehearsing a lot, in Brooklyn, in a friends basement in Park Slope, and it was really humid down there. It was challenging rehearsing all day and taking the subway home. Down in the subway it was like a clay oven, until you got in the cars. Basically we were going from intense heat into air-conditioning, which I hate as well. It focused me more, because I just had to get to this place inside of me that would allow me to ignore the heat and just focus on the music. In some ways it was a good thing, like in the way you do hot yoga: you can focus your attention, your breathing on the postures that you’re doing. I think that the phenomenon was working itself out. It forced us to really get into the songs and be there, because it was so uncomfortable to be in that climate rehearsing. It brought out some neat arrangements. It brought out some good ideas. At the end of it, it kind of made me a bit crazy. I certainly don’t thrive in that kind of weather, but the good thing about it was that it all lead to an emotion pushing me out of my comfort zone. Sanderz: As an artist you are likely to embrace change to allow yourself to grow. If you would apply this theory to climate change whether it’s anthropogenic or not, should we just go with the flow? Chris: No. My initial answer is no. I must admit that there is a part in me that comes up sometimes in my thinking that says: what is going to happen is going to happen, regardless of what we do. It’s hard not to feel a certain level of fatalism about it, and in my darker thoughts I wonder if it’s just an unavoidable consequence of unchecked human population growth, and our human nature to want more than we need that disconnects ourselves from our environment. But then of course, I don’t want to see that sort of global correction happen and all the a pendant, horrible consequences that it will have on humans and the environment. The earth will be fine on its own, but it may mean that mankind is wiped out and that is not something I want to see happen. Primarily, I’m very hopeful, I’m an optimist and a fighter. So I think we have to find a way on a daily level to not be consumed by the fear of climate change. You have to be hopeful. What I’m trying to do, is to be conscious and take responsibilities for my actions and behavior: the fact that I have energy consumption, car use and so on. I’m always aware of that and try to live by example if I can. I try not to get so distraught by it that it interferes with my ability to be happy on a daily bases. So the answer must be: a certain amount of ‘climate flow’, but I’m also consciously aware of my actions so that I don’t just, in the defeatist way, give into that impulse. Sanderz: You have donated “Napkin Manifesto” via Patagonia to the Big Wild, a Canadian conservation movement to protect Canada’s wilderness. With less than 10% of its wilderness protected, what in your opinion could we contribute to limit the dangers of exploitation and extraction of Canada’s resources? Chris: I think many Canadians are unaware of the stresses on our wilderness. I think it is part of the Canadian psyche to take for granted that we have this ‘endless’ wilderness and that it will always be there and we don’t need to do anything. There is so much of it that we can’t possibly destroy it. The fact is, that it’s under more pressure than ever, certainly under this current government. Probably under any government there is just going to be more and more pressure on its resources, like fresh water, forests, minerals, coal and certainly the tar sands. I think part of it is, that Canadians need to realize, that first of all you cannot take Canada’s wilderness for granted. That’s a big shift in thinking right there. I think most Canadians, when they hear protecting Canada’s wilderness, say: ‘Well, why? There are much more pressing issues.’ When you see how little of it is actually protected, you start to realize that it is more precarious than you think. Just on a starting level I’m aware that our legendary wilderness is actually under threat. Then after that, I would say: ‘Look at the various government policies and the policies of the various parties to see what they are doing. Right now environmental protection is not even spoken about by the conservative government. They pretty much squandered Canada’s environmental reputation on the international stage after Kyoto and made no secret of their disdain for environmental regulation. They’re referring to environmental groups with thinly veiled comparisons to terrorists groups. If you’re aware of what each party’s policies are on the environment, perhaps you can vote accordingly. It is a long process and it is disheartening especially now, because we have this government that’s going to be there till 2016 or so and it is going to be an ‘octo’ battle. Unfortunately the Liberal party of Stephane Dion tried to unveil a very ambitious and progressive green policy at the time when the whole global economy was collapsing. It was just poor timing. It’s going to take a while now to get that back on the national radar. It’s an important objective. There has a lot of damage been done to Canada’s reputation by the current government. I’m embarrassed by it. All the more reason to have people take action at a local level and not wait for the government to take action, because they are really not (laughs). To be truthful: You can’t expect a government to solve your problems, but in this case it’s exceptionally true, because we have a government that’s hostile to the environment. Sanderz: You’re a ‘1% For The Planet’ member. Can you tell me something about that? Chris: ‘1% For The Planet’ (www.onepercentfortheplanet.org ) is an organization that asks businesses to donate one percent of their revenue to an environmental cause of your choice. 1% collects the money and pass it on to the group that you’ve chosen. The purpose behind it is for businesses to recognize that they have an impact in their dealings on the environment and that it should be internalized at the cost, symbolically at least. I like that message. I think that’s some of the things what is wrong with the capitalist structure right now. It doesn’t internalize the social and environmental costs. That’s why, among other reasons, there is such an environmental degradation right now on the planet. So I like this notion of taking responsibility for the fact that you, as a business, when benefiting from certain common goods, you, as a business, should pay for them. I’m not a big company, making a lot of money, but I think it’s never too early to make that gesture for what you’re doing and a chance to sort of send a message to people who like your music and have them inquire what 1% is, and show that you’re in support of that wonderful organization. I’m glad to be a member. Sanderz: For your summer tour in 2009, supporting your album “Solidago”, you teamed up with Reverb. Can you explain what this collaboration entailed? Chris: In my case it’s on a much smaller level than the other acts that Reverb (www.reverb.org ) partners with. Acts like John Mayer or Jack Johnson, who have a big operation when they go touring. There’s a lot of opportunity for them to have an effect on their carbon footprint. It’s much more discernible. There are a lot of artists like myself, thousands of artists, with a small footprint, touring on a much smaller level and with a smaller budget. When you aggregate all these artists, emerging artists, that are crisscrossing the country, it does add up in carbon footprints. Reverb is just starting to look at touring and the music industry from a more independent level, as opposed to the larger touring act level. So I proposed to Reverb that I could be their ‘man on the ground’, their sort of ‘smaller artist man on the ground’, and get them information from venues via questionnaires. It gives them a chance to collect information about the do’s and don’ts of these venues, anything from recycling to what kind of light bulbs they use and how they can change that: ways how they can encourage venues to pull in more green practices, have people be aware of the imprint that music, touring and being a music fan has on the environment. It gives Reverb more research, more input and info how to tailor their campaigns for bands to create more awareness and how to lessen their carbon footprint. Sanderz: On the basis of a positive perspective that you can learn from every life’s experience; What did you take out of your law study that translates into music? Chris: It was my goal to go into non-profit, environmental law or international human rights, based on the interest that I want to do positive things with my education, with the practice of law. In the end music was what really inspired me and I realized, looking down the barrel of a career in law that my heart wasn’t in it, the way that it was for music. I still could achieve those goals by promoting social change and helping people through music in a way that could be more effective. But less effective on a practical level. Law helps people in a practical way and music more in an abstract way that law can’t in terms of reaching people, making people think about an issue or an emotion in a different way. I never thought that music and the law in my case, in the terms of what they meant to me, could really have any connection, but I realized it was just an extension of what I set out to do in law in the first place. Sanderz: After being a lawyer for a short period of time you decided to join two college friends to make a documentary in Sierra-Leone. What initially made you choose this change in direction and what impact did this experience have on your live? Chris: That was sort of an irresistible opportunity that came up at a point in my live where I was questioning law as a career at the end of my articling year in Vancouver: starting as a junior lawyer in a private business law firm or going off and doing this trip to the west of Africa, making a documentary (www.sierraleonesrefugeeallstars.com ) and trying to find musicians to tell the story of the civil war in Western-Africa. It proved to be an irresistible adventure for me, because it came at a time where I was trying to find a way to bring music back to my life. I really had a hard time saying no to the trip, that invitation, because it also did hold the promise of discovery and telling a story of humanitarian crisis in Africa. That was actually an opportunity to use me, to touch upon issues, international issues, humanitarian issues. We didn’t really know what form it was going to take. We were very ‘green’. Perhaps had we known what we were getting into we might not even have left. Thankfully we had no idea, but it was one of those events in my live, one of those crossroads, and I’m very glad that I took that path because it did lead me back to my own music. Sanderz: You fear that ‘our planets future cannot withstand our arrogance’. In relation to your conviction that social justice and activism are a moral imperative; What do you consider a good way to bring about a change in mentality? Chris: Mentality is a big problem because it dictates behavior too and we react. We choose to respond or not respond. I think it starts on a very basic level with engendering in yourself a sense of compassion. On a daily bases allow yourself to go to the exercise of feeling what someone else may be feeling: someone you see on the street, a homeless person, someone who is in more difficult circumstances than you. It’s a very small step, but I find when I do that I immediately open up. It opens my heart, makes me more compassionate and it makes me in that moment, but also throughout the day, think more about other people. I think that’s the key in a way. Engendering compassion is where it starts. It’s when we start to feel disconnected from each other, from our communities that’s when apathy, fear and intolerance starts to grow, because we don’t see ourselves inseparate from the people around us, people who are in different social-economic conditions than ourselves or people in other countries and it’s very easy then for the political forces to take advantage of that and divide and conquer. It doesn’t come easy to everybody, but it’s imperative to work on that and try and keep as open as you can to other people. I believe it can make a profound change if that happens on a collective level. If people spent a minute or two every day thinking not about themselves, but about someone else, that sort of shift could have such a ripple effect. Sanderz: What do you do in your daily life/at home to reduce your carbon footprint? Chris: On all levels: from the amount of time I spend in the shower to recycling, doing the dishes, using cold instead of hot water, hang dry my clothes instead of putting them in a dryer. I’m really trying to be aware of it. I park my car in Brooklyn for a month at a time without using it. I use the subway and I really like that. I feel good about that. I’m trying to be aware of what I’m buying and to be conscious of the packaging. Little things like that. I’m a big believer that those things really add up. If I’m not going to be taken those efforts on a daily bases, how can someone else who makes even less than me make those steps? I’m really trying to change my behavior on a day-to-day bases, on a more detailed level. Sometimes I succeed more than others. It’s my mission to have less and less of that footprint. Rather than buy new clothes I’m trying to resist the impulse, even though it can be tempting sometimes to buy a pair of jeans, or whatever. I look where a product is made, how far it had to travel. There’s a million things you can do every day that have an impact. Sometimes it feels a bit nitpicky, but how will things get better if I’m not taking responsibility for those small daily, banal choices that really add up? It’s very easy to write them off. I’ve spoken with people who say: ‘What difference does it make?’ But I feel that’s the key and it makes all the difference: those million choices that get made on an individual level. Chris: Yeah, that’s it. It’s behavior. I found myself being really uncomfortable (laughs) in other peoples places seeing wasteful things happening. We’re such simple creatures in a lot of ways. We’re creatures of habit and if you can change your habits then suddenly that becomes the new norm. Sanderz: Thanks for your in-depth answers. Chris: My pleasure. I liked the questions.